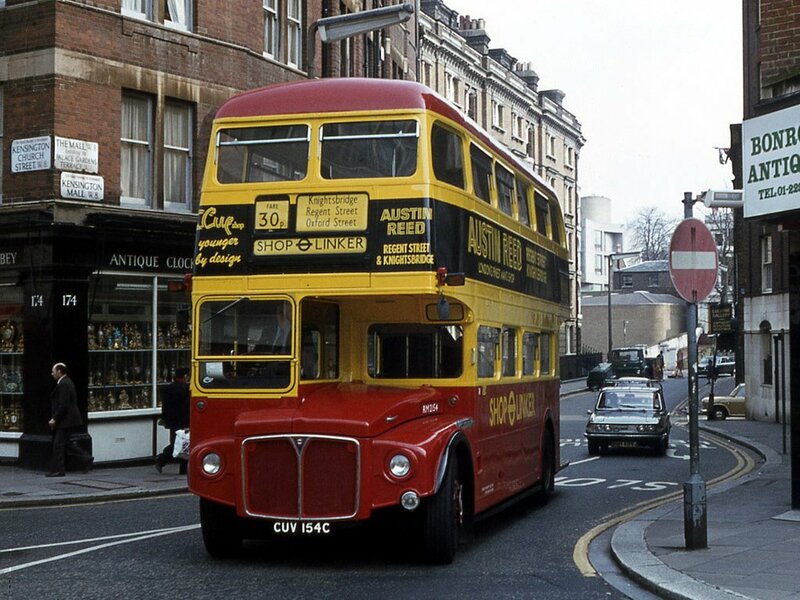 Forty years ago one of London’s short lived bus routes was seen on the capitals streets for a few months. 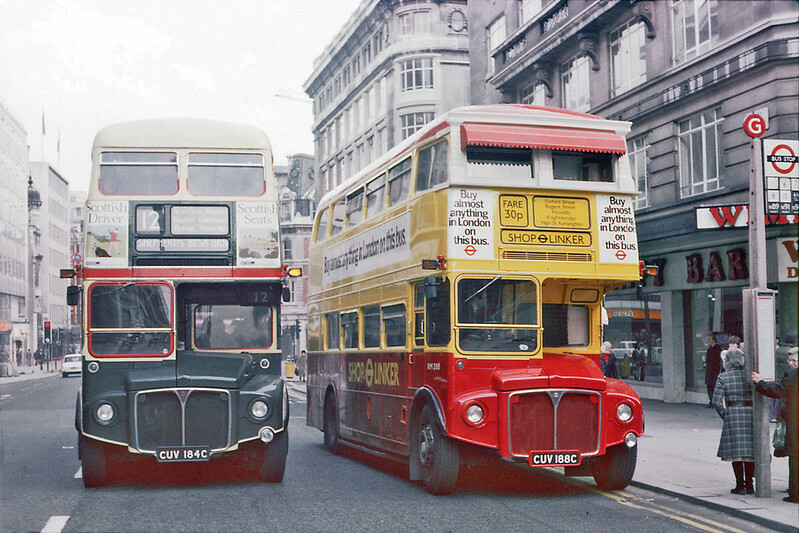 This was Shop Linker with its red and yellow buses. The idea of the service was to provide an easy and convenient link between the West End and Kensington High Street. Though it was at tmes fairly well patronised it wasn’t very successful in terms of earnings, probably because the 12, 14, 30, 73 and 88 routes were a cheaper alternative. Despite offering a flat fare Shop Linker was on the expensive side. 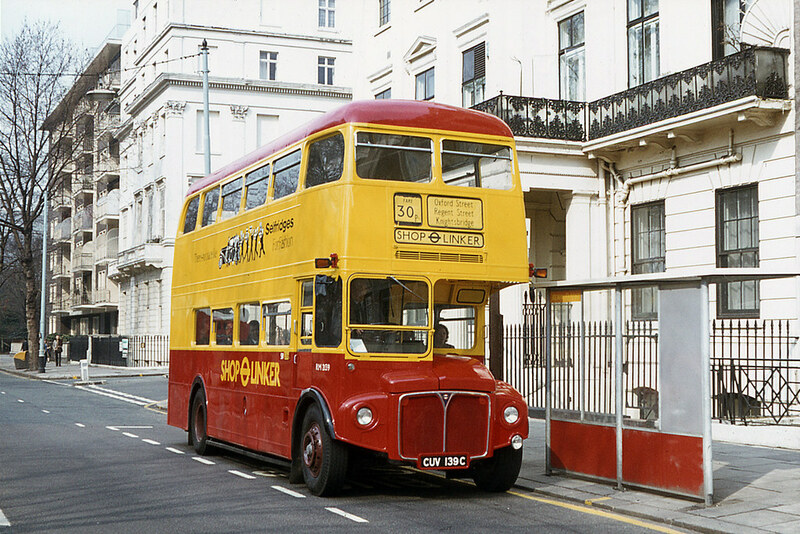 It was a circular bus service that ran along Oxford Street, Regent Street, Piccadilly, Hyde Park Corner, Knightsbridge, South Kensington, Stanhope Gardens, Gloucester Road, Palace Gate, Kensington Gore, (this ‘u’ shaped route through the nether regions of Kensington was mighty unusual for a major London bus service) High Street, Church Street, Notting Hill Gate, Bayswater, Marble Arch and back to Oxford Street. Shop Linker began operation on 7th April 1979, which was the same day as the last RTs in London ended service – see my post on this. 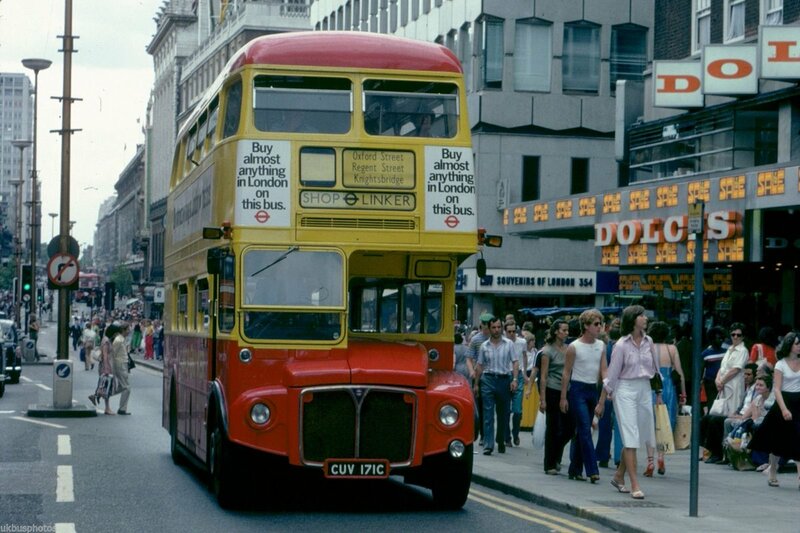 The ‘new’ yellow and red buses ran from 9am to 5pm, except Thursdays til 8.30pm – London’s traditional late opening evening. 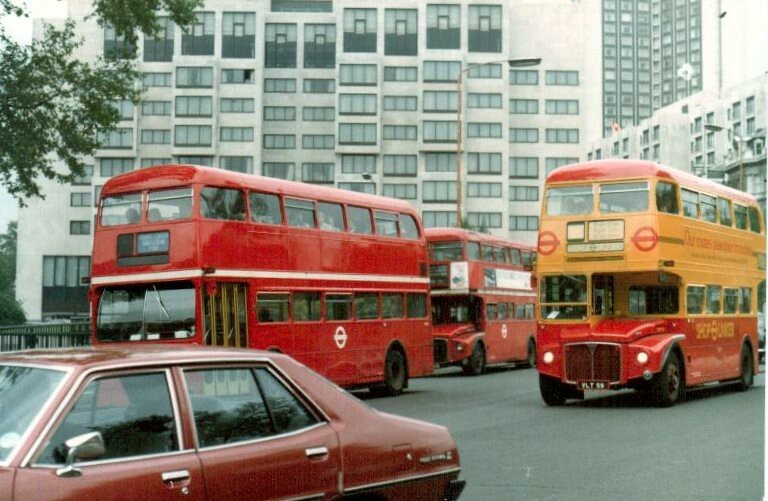 Buses were provided by Stockwell Garage and the service frequency was touted as being every ten minutes. 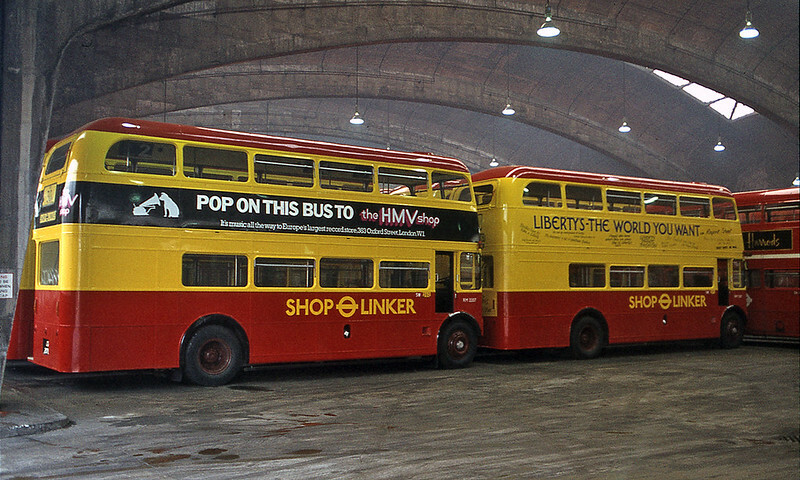 It has been claimed the Shop Linker livery was derived from that used for the local Harefield bus services. Its possible although there’s no way to verify this. This Flickr page shows that livery. It seems the Shop Linker had a deeper red. Shop Linker services terminated at Hyde Park Corner/Park Lane or at the north end, being Marble Arch, where the route was generally based in terms of crew rests and switch-overs. Park Lane itself was of course the only part of the lengthy route where buses could be juggled around to try and regulate the service. 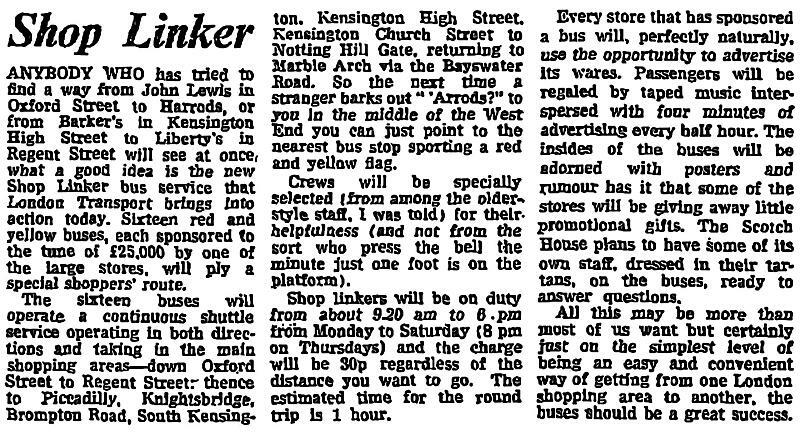 The fact quite a few Shop Linkers terminated at Marble Arch because of delays or crew shortages meant it wasn’t really that effective in terms of the service it claimed to offer. People have queried on forums whether the Shop Linkers provided a service along Park Lane. 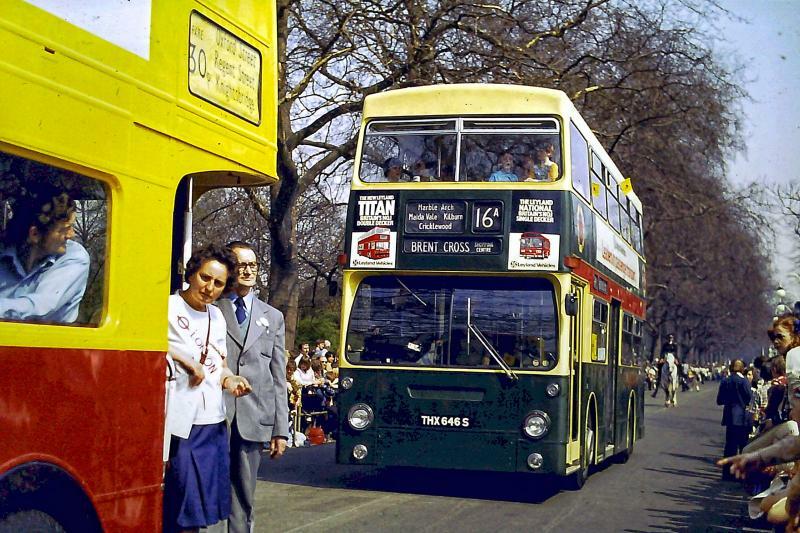 There are quite a number of pictures showing Shop Linker buses complete with passengers on board in Park Lane however that was due to the fact these buses had to venture much further south than usual, before turning north to reach the main Shop Linker stops (and crew rest-over) a short distance south of Marble Arch. What this means is the buses ran south as far as Upper Grosvenor Street then turned back along the northbound Park Lane to the dedicated Shop Linker bus stops/stands. Other bus routes such as the 12 and 88 did not have this quirk they simply went straight through the Marble Arch gyratory system and so did not incur a significant time penalty as the Shop Linkers did. If passengers had even the slightest temerity to complain about the music or the advertising being broadcast there was nothing they could do except make a complaint to the authorities. Even the bus crew could not do anything. The reason for that? The equipment was securely locked away – not even the bus conductor had the keys needed to silence the speakers should the need arise! Originally the intention was to curtail the Shop Linker service on Sunday 30th September 1979. Instead services ended on Friday 28th September 1979. No doubt London Transport saved a few pennies! 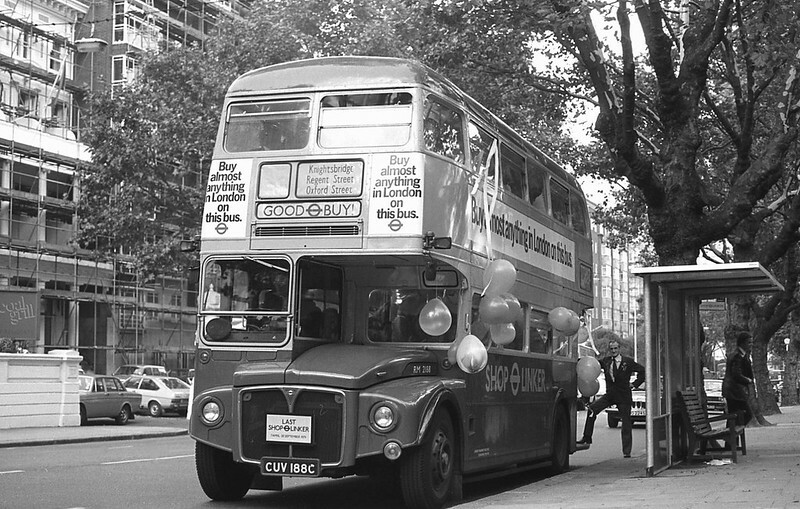 LT bus fares were raised on 9th September 1979, the second such in three months. The Shop Linker service retained its 30p flat fare to the end of that month whereas the Red Arrow buses had theirs increased from 12p to 15p. 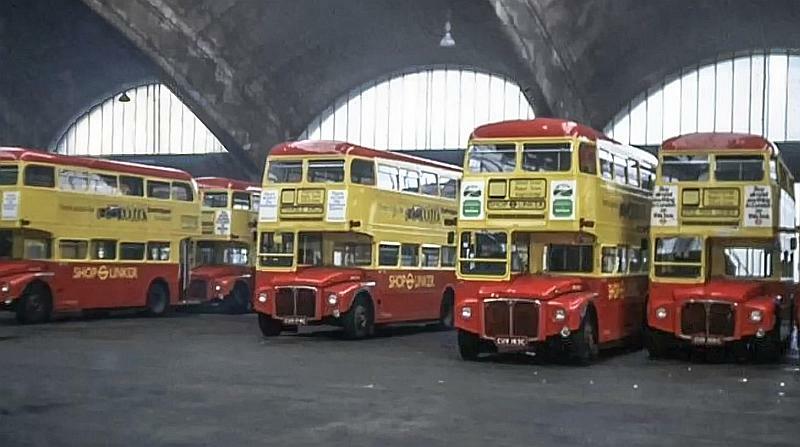 The service operated on a flat fare basis, eg 30p. 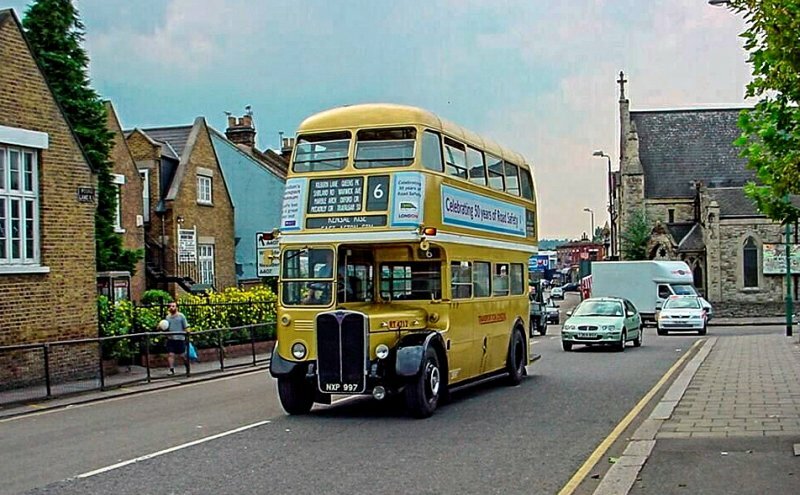 The fare was displayed in the bus number panel and a number of complaints ensued because people thought it was the 30 bus, which did incidentally run along a good bit of the Shop Linker route in those days en route to the 30’s former terminus at Roehampton. The ’30p’ was soon replaced by a blank window which helped somewhat. For prosperity’s sake here’s this special image showing a Shop Linker RM, a RML and the one and only FRM by courtesy of Colin Pickett. 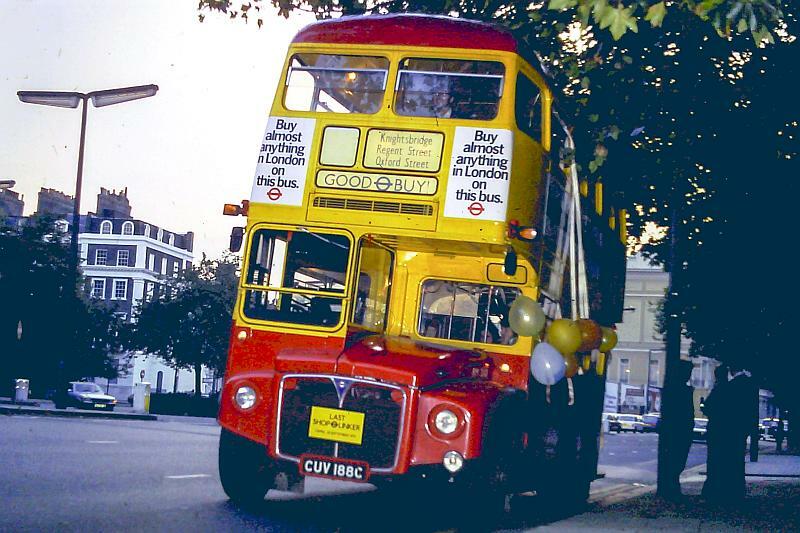 FRM1 was an experiment at providing a true rear engine/front loading Routemaster bus – however no further such buses were built – although there were the more successful traditionally styled front loading RMs on the BEA services to Heathrow as well as some Green Line services. A different perspective of the Shop Linker’s line-up at Stockwell garage. Shop Linker at the London Bus 150th Anniversary Parade in Battersea Park. (Pic from my collection.) 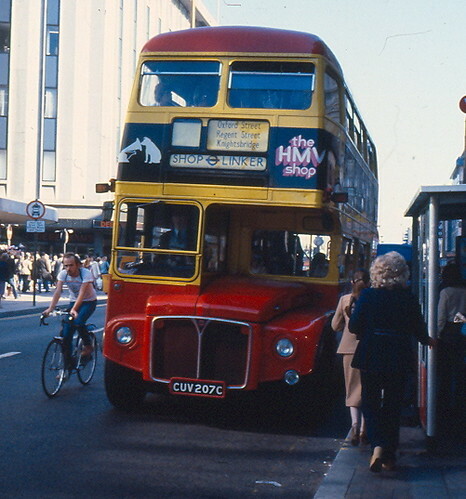 The DMS bus in Shillibeer livery behind is from Cricklewood and depicts the former 16A route from Oxford Circus to Brent Cross. A couple of pictures from the final day of services. One from Flickr and the other from slides in my collection. The feature image at the top of the page is from one of my slides and depicts the last Shop Linker service at Marble Arch. Another slide from my collection showing RM2188 on the final service. 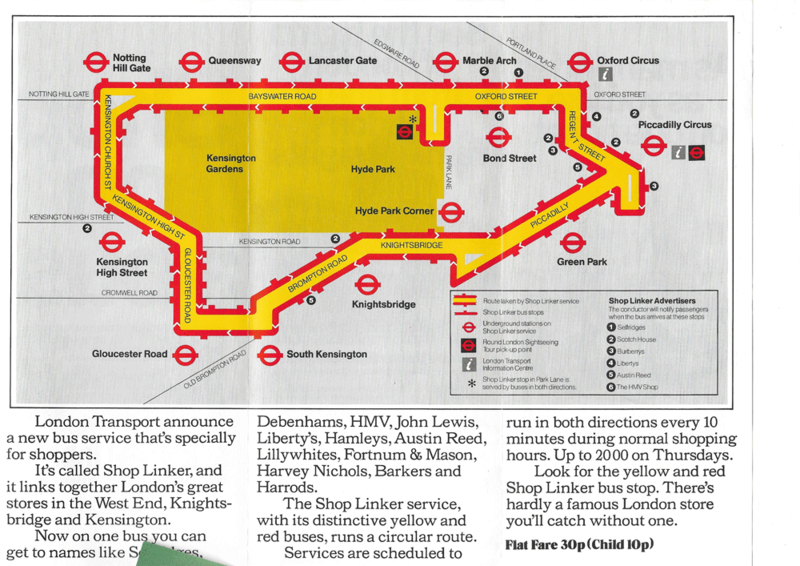 Unless I am wrong it seems the Shop Linker was not featured on London bus maps. I have the 1979 editions and the service is neither mentioned nor its route shown. A special leaflet advertising the service was produced however and the back of this shows the Shop Linker route. See London Buses website for this. 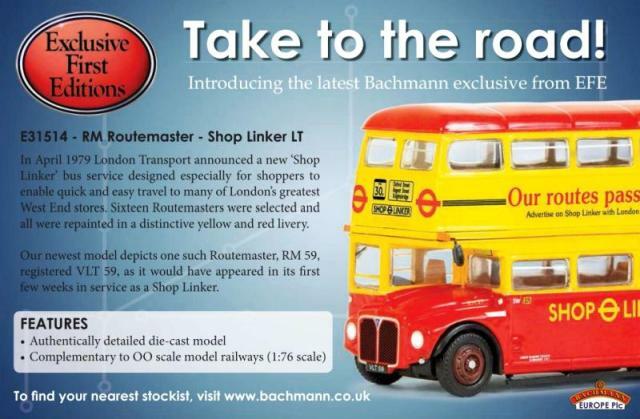 The Bachmann 00 scale model of Shop Linker – featured in Collectors Corner magazine. 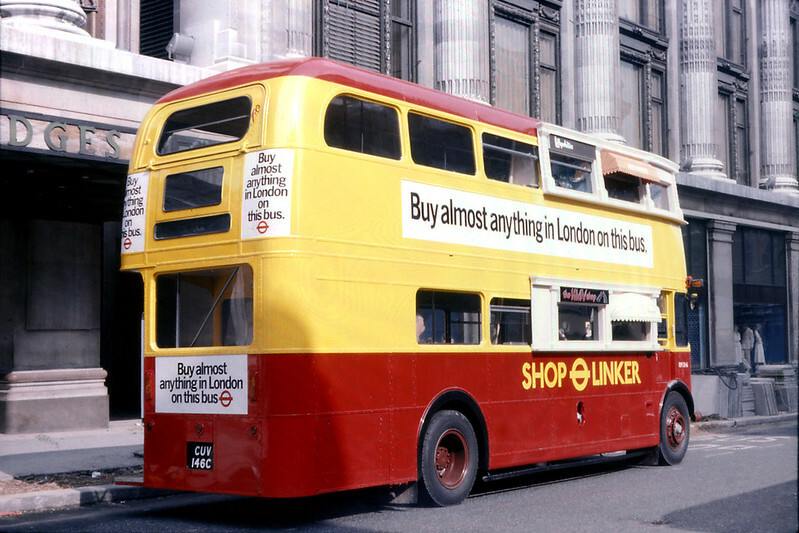 Just to whet your appetite here’s a further selection of Shop Linker bus images from AEC Southall’s website, and this page from London Bus Routes which gives the full list of RM’s used for Shop Linker.